Retired general René Emilio Ponce, a former Minister of Defense of El Salvador who was accused of ordering the murder of six Jesuit Priests in 1989, died on Monday, May 2nd, at the age of 64. In a statement reported by The New York Times, the Defense Ministry said Ponce was admitted to the hospital last week for heart problems, and died later at a military hospital in San Salvador. Ponce was under investigation in Spain for allegedly giving the order during a meeting of senior army officers to assassinate Father Ignacio Ellacuría, a Spanish citizen and rector of the University of Central of America, and his colleagues. 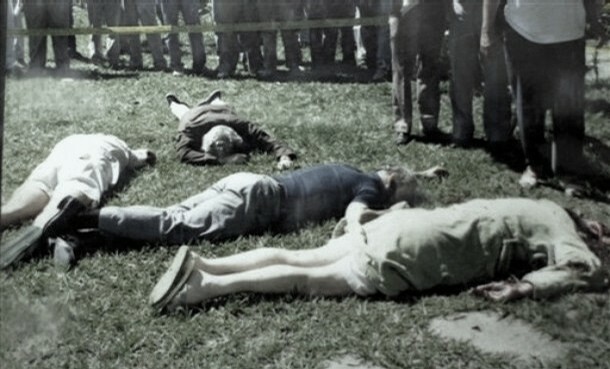 Hours after the meeting, on November 16, 1989, the Jesuits were found dead on the university campus, along with their housekeeper and her 16-year old daughter. 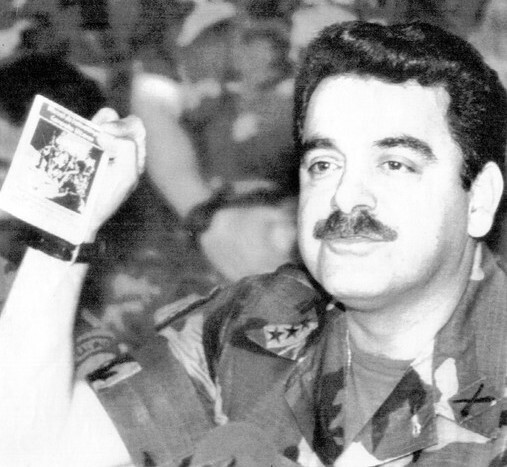 Although a U.S. congressional investigation and the United Nations Truth Commission in El Salvador both concluded that Ponce was one of several senior army officers involved in ordering the killings, he was never tried for the crime. In 2008, the Center for Justice and Accountability filed a case before Spain’s National Court under the principle of “universal jurisdiction,” charging Ponce and 14 others with responsibility for the assassinations. The National Security Archive’s Kate Doyle provided expert testimony in a 2009 hearing before the Spanish court to authenticate hundreds of declassified U.S. documents entered as evidence in the case. Many of the documents came from a collection of some 12,000 State Department, CIA and Pentagon records released in November 1993 by President Bill Clinton following publication of the UN Truth Commission’s report earlier that year. Another expert witness, Dr. Terry Karl from Stanford University, produced an extensive analysis of the documents for the court. 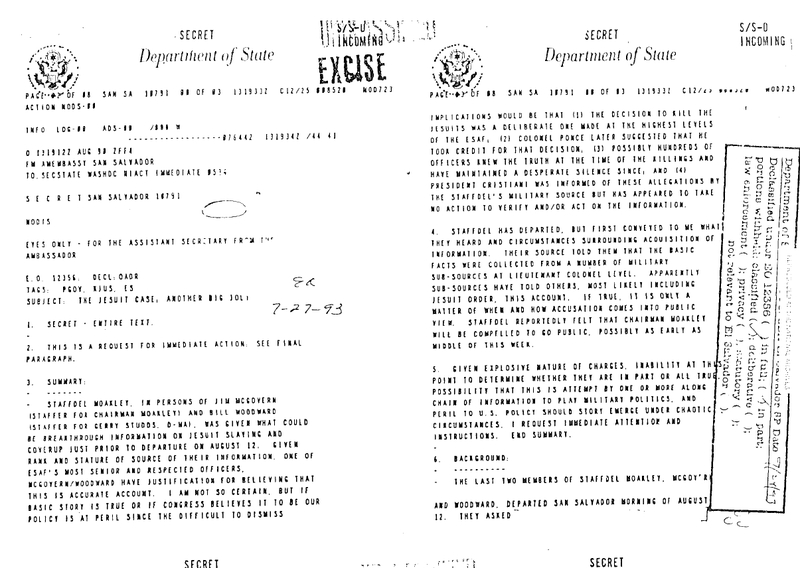 An example of the declassified records that implicate Ponce – who was a colonel and Chief of Staff of the Salvadoran armed forces at the time of the murders – is a secret U.S. Embassy cable from August 13, 1990: “The Jesuit Case: Another Big Jolt.” The cable contains information provided to U.S. Representative Joseph Moakley indicating that the decision to kill Jesuits was “made at highest levels” of the armed forces, and that Colonel Ponce “took credit” for the decision. The document goes on to report that possibly “hundreds” of officers knew about killings before they took place, and President Cristiani was informed but took “no action” to verify or act upon information. Ponce’s death removes him from the reach of the Spanish investigation, which continues. The National Security Archive published an edited collection of some ten percent of the declassified records released by President Clinton in our “El Salvador: War, Peace, and Human Rights, 1980-1994” which is available through subscription on the Digital National Security Archive. Nearly all of the declassified documents are also available at the National Archives and Records Administration reading room in College Park, MD and the Library of Congress’s Hispanic Reading Room. ← Will Osama bin Laden’s Death Photos be Released Under FOIA? Probably Not. Unfortunately for you creditability, this is a lie. Next time, I suggest you try doing your homework and not simply follow the secular allegations.